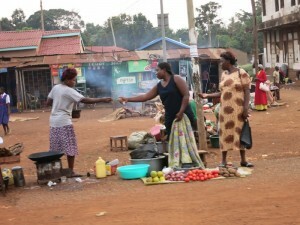 This is one of the many findings from a ground-breaking study of cross-border trading at Busia. And while banks worry about being out-innovated by telco’s, and telco’s worry about being out-innovated by apps, the truth is that it is the consumer who drives the innovation. M-pesa was an accidental by-product of an airtime transfer product, and long before M-pesa, bank customers were doing free instant money transfers using the bank’s IT platform, thus bypassing money transfer giants that charged 10%. It is very likely that customers continue finding new ways to use banks and mobile money (such as M-pesa) in ways that the institutions are not even aware of now. Going to a bank was a time-consuming chore. Few benefits were perceived, and an account was considered to provide little or no ROI except when required as a prerequisite such as by the local Coca-Cola wholesaler for registering as a new distributor. Many considered bank accounts a trap for cash which could be put to better use as working capital, generating returns on investments in inventory. Bank charges made no sense. Teresia has six years under the shade of the same tree and, since devolution, has been paying daily rent in the form of market fees to the local county council. Yet this, along with her internal migrant background hampers her efforts to obtain a loan at the local bank. She’s neither local nor has a permanent address – and in their eyes, she’s high risk. Traders, brokers, currency exchange agents, and transporters, all had anecdotes on the variety of arrangements available for cross-border transactions, with and without the use of a bank account. These arrangements were within the limits of the law, for the most part, and were made to account for the barriers thrown up by lack of interoperability between telco service providers and their networks. This entry was posted in bank service, M-Pesa, Remittance, SME solutions on August 7, 2016 by bankelele.